The names of the recipients for the Lait’xcellent awards, a competition that rewards milk producers who stand out in the province for the excellent quality of their milk, were revealed by Les Producteurs de lait du Québec at its Annual General Meeting. According to its owner of the same name, Ferme Denis Desfossés’ winning recipe for quality milk is based on exemplary practices in terms of clean equipment, herd health monitoring, rigorous milk controls, and generous straw bedding for his herd of 34 cows. The herd’s bulls are chosen based on their low somatic cell count profile and the strength of their immune system. Ferme Denis Desfossés has received the Gold Lait’xcellent Award in the last three years. In the last 14 years, Ferme Denis Desfossés has ranked 13 times among Quebec’s top 25 dairy enterprises for the quality of its milk. 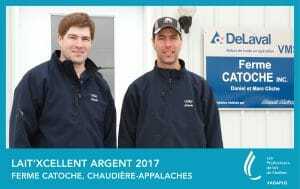 Milk producers, brothers and co-owners of Ferme Catoche, Marc and Daniel Cliche focus on a set of factors to assure the quality of the milk produced by the 57 cows in their herd. Sound management of the deep bed stalls is the critical factor for obtaining quality milk. They use milking robot analyses to monitor somatic cell counts and make rapid adjustments. In the last three years, Ferme Catouche has received a “Great Distinction” certificate for its milk quality, but this is the first time it has won a provincial award. At Ferme Jolipré Holstein, the main factor for producing quality milk is cleanliness, from the animals and equipment to the environment. Régis Lepage and Marie-Josée Turcotte regularly monitor their cows’ somatic cells and udder health to keep their herd of 90 cows producing quality milk and comfortable. 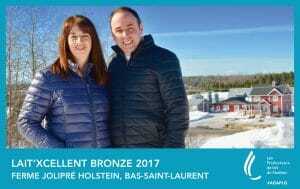 This is the first time that Ferme Jolipré Holstein has been one of the three provincial winners of the Lait’xcellent competition. From 2013 to 2015, it finished second regionally and, in 2016, improved to first regionally. Press release: “Three Quebec milk producers rewarded for the quality of their milk“.